Availability: fully booked up! ask about next year, similar dates! Special offer: $200 total discount for two persons signing up together! The first day will be spent flying to Torshavn, Faroe Islands. We will have time to get settled in a new country, by first staying on island of Vagar. We will embark on a casual evening and sunset photo shoot around the iconic Gasadalur village which is set idyllically above a waterfall that pours into the nearby ocean. Our first Vagar Island full day of photography, which will include visiting stone fishing shacks on the beautiful Sorvagsvatn lake. Then we will go on a hike around Sorvagsvatn to the far end, which features a stunning view of the lake outlet waterfall as it falls into the ocean below the sea cliffs. After we finish exploring and taking photos we'll return via boat taxi. Once we're back in town we'll continue our evening with exploration around Trollkunufingur sea cliffs. To wrap up the night we will all have dinner in Sorvagur town, then watch the sunset overlooking Tindholmur point and islands. Day three will be spent on Streymoy Island enjoying idyllic ocean and country scenes including Tjornuvik beach which is surrounded by giant mountains, the classic Saksun grass roofed church, and a gorgeous ocean inlet. These astonishing sights will leave you feeling as if you've traveled back in time by 1,000 years to the viking age. There will be ample time to explore and photograph all of these beautiful locations that Streymoy has to offer. Here we will stay in a large private airbnb home for our group. Exploration of the northern islands north of Klaksvik, including Vidoy and Kunoy Islands. Included is a ferry boat ride out to Kalsoy island, where we will explore the little local communities and hike up to the Kallur lighthouse on the northern tip of the island. We'll return in the evening for sunset over Klaksvik, and a 1 hour drive around Eysturoy Island to Gjogv for the night. We will spend the day taking photos around Eysturoy with the option of hiking up to the highest mountain of Slættaratindur, featuring amazing panoramic views of the island channels where we will have plenty of opportunity to practice our panoramic photography skills. Finally we will take a small trip to Tjornuvik over on Streymoy for some bay and cliffline telephoto shots. 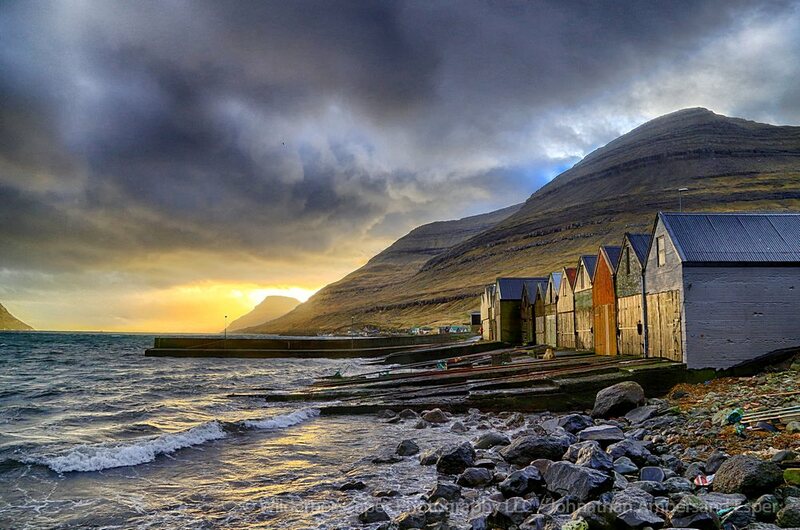 There are also plenty of additional fjords to explore and photograph on the island of Oyndarfjordur. A stunning scenic drive among the local islands and through the brilliant under-sea tunnels, with many stops along the way including some gorgeous waterfalls. There will be plenty of scenic locations on Streymoy Island to capture that will fill most of our day. In the evening we will continue on to Klaksvik. There we will enjoy a pastel sunset over the town of Klaksvik and a panoramic vista view over the islands and sea channels. We will stay at the beautiful Hotel Klaksvik for the night. A day of waterfalls and picturesque seaside communities on Streymoy island while overlooking Vestmannasund. Arrival into Torshavn, the capital city of Faroe Islands. 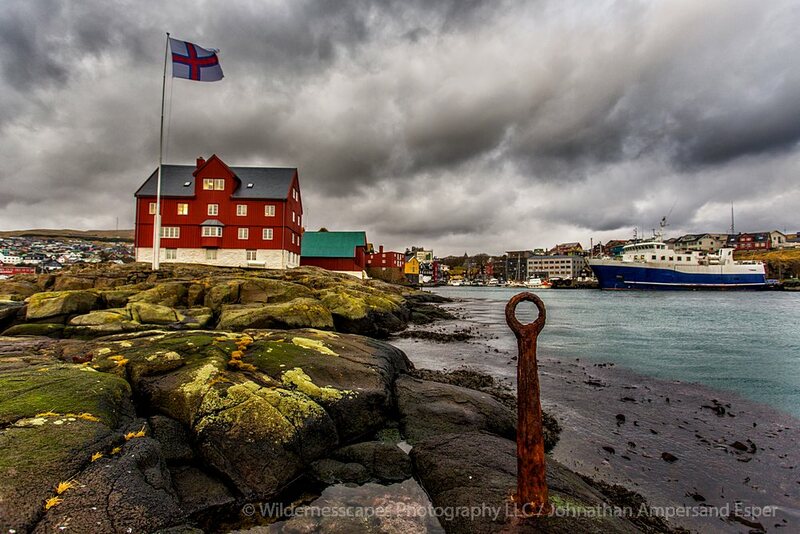 Daytime photography of the local red historical harbour buildings and fort, and some time on your own in Torshavn to explore at your leisure. Then we will regroup at a delicious seafood restaurant in Torshavn for dinner. Evening and sunset photography and a short drive out of town to view the overlook at the Hestsfjordur ocean cliffs. One last morning for photographing any spots you may have missed on previous days or favorite locations you want to enjoy once more. We will then drive back to Vagar Island (1 hour) by midday for your varying flights from FAE Vagar Airport back to Iceland or Copenhagen. Thus concluding the trip. Start/End: The trip begins in and concludes at Vagar Airport (FAE) Faroe Islands, from where you will return to Europe directly or North America via Iceland. 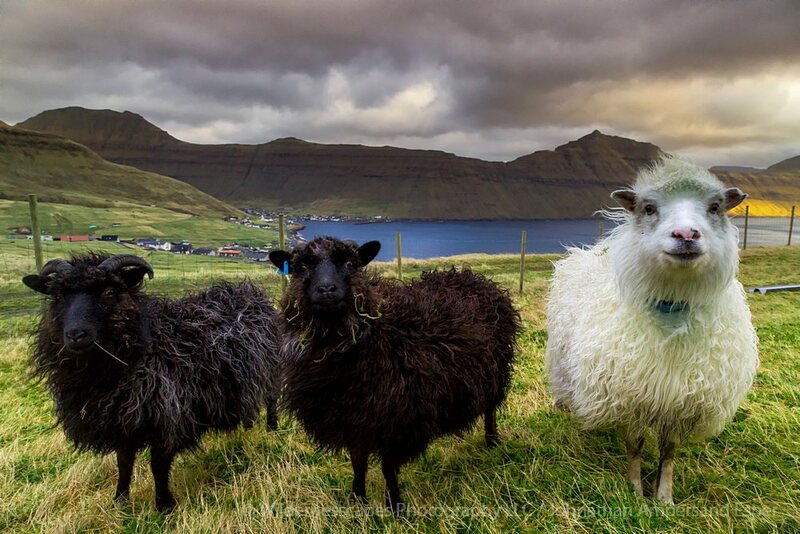 Our itinerary offers a balanced mix of sightseeing and serious photography all around the Faroe Islands, for a comprehensive overview of this island archipelago. Accommodation for 7 nights. Accommodation will be chosen based on optimal locations to photograph, and will vary including authentic Faroese guesthouses, and hotels, and seaside whole private homes rented out for our group. Some accommodations have shared bathrooms among the rooms of our private houses. Prices are based on double occupancy -- optional single supplement may be available for an added fee of $500. Experience Level: This tour is open to digital photographers of all skill levels. A packing list will be provided. If you have additional questions, the trip leader will be happy to answer them over the phone or by email. This photo workshop is all about in-the-field field photography and situational instruction, working alongside your trip leader, and there will be no classroom workshops or presentations, unless there is extra downtime from rainy weather. Photographic topics that will be covered while shooting include classic landscape photography composition and technique, HDR (High Dynamic Range) imagery, panoramic photography, adventure and travel photography, tilt/shift focusing, slow shutter speed effects, and exhaustive use of filters. We will also be going on some shorter hikes (2-5 hours) to truly experience the land. Group participants may wander on their own occasionally if they wish to pursue individual photographic objectives, enabling each participant to get the most out of this once-in-a-lifetime trip. A maximum group size of 8 photographers ensures you will receive ample personal photographic coaching in the field from a full time working pro, maximizing the group's flexibility and ability to shoot more places, more spontaneously based on light and weather, and provide an intimate small group adventure experience. Johnathan Esper of Wildernesscapes Photography LLC, based in the USA, will be leading the trip. Johnathan is a full time photographer and experienced international photo trip leader, and this will be his 60th+ trip he's led to Iceland since beginning trips to the destination in 2011, and his 4th time in the Faroes. Every trip so far has been an incredible experience for the participants. Johnathan has a unique background and an intimate knowledge of Iceland from living out of a car, exploring and photographing Iceland intensively for months at a time. He specializes in wide panoramic landscapes and adventure photography in Iceland and the Adirondack region in the USA.